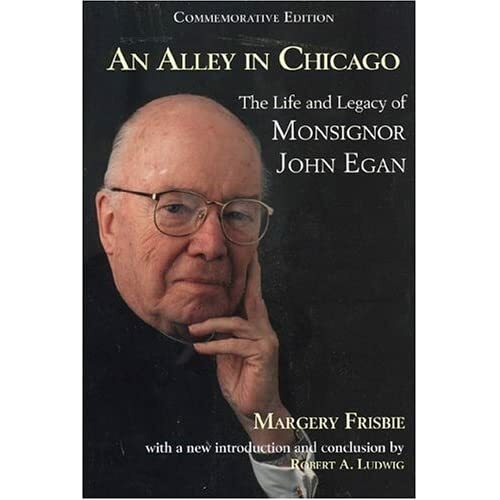 Monsignor John Joseph Egan (9 October 1916 – 19 May 2001) was chaplain of the YCW in Chicago from 1943 to 1955 and the Christian Family Movement from 1947 to 1953. From 1946 to 1959, he served as the first director of the Cana Conference of Chicago, a ministry established to serve the needs and enrich the marriages of young Catholic couples. The first “pre-Cana’’ conferences that formally prepared couples for Catholic marriage grew out of this ministry. Named a monsignor in 1957, he became the director of the archdiocese’s new Office of Urban Affairs, a post he held until 1969. Msgr. Egan was a member of many church-related and communication organizations during this time, including the Chicago Conference on Religion and Race, the Archdiocesean Committee on Poverty, the Interreligious Council on Urban Affairs, and the board of governors of the National Housing Conference and the Metropolitan Housing and Planning Council. He was also one of the first priests to march in the civil rights campaigns in Alabama in the early 1960s. He also worked with Saul Alinsky.